Lyssa Peate has found a tenuous balance between her double lives - the planet-discovering scientist and space pirate bounty hunter named Razia. No longer on probation, Razia still struggles to be thought of as more than a chocolate-fetching joke, and Lyssa can't be truthful to those closest to her. But both lives are turned upside-down when feisty government investigator Lizbeth Carter shows up to capture the same pirate Razia is after. Lizbeth's not interested in taking Razia's thunder; rather, she convinces the caustic bounty hunter to help solve a mystery. Somebody's hiring pirates to target government ships, and there's a money trail that doesn't make any sense. From the desert planet of D-882 to the capital city on S-864, the investigation leads them deeper and deeper into a conspiracy that reaches to the highest levels of the Universal Government - and to one of the most painful chapters in Lyssa's past. 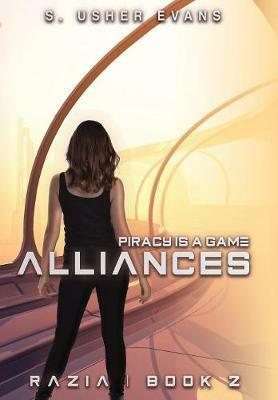 Alliances is the highly anticipated sequel to Double Life, Book 1 in the Razia Series. Also included in this edition is a bonus short story featuring Lizbeth Carter.